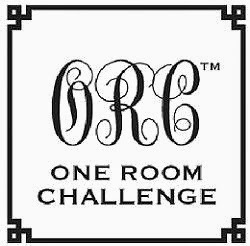 Why would we change the counter in the bathroom when we have perfectly good Formica?...Said my husband 2 days before the One Room Challenge was scheduled to begin. My response was a calm, measured, disbelief in how we ever managed to get married "I know we have other places we need to spend money right now. I get it. I think I can still make it look good." I was trying to work around the Formica and make the room look its best with the finishes it had. But like most projects, they can evolve over time. And when we finally got an estimate for remnant piece of marble, the hubby was all in. Did you know that a remnant is the same price per square foot whether you install the cheapest granite or the most expensive marble? If you can find a remnant that will fit your bathroom, in the finish you want, then I highly recommend going this route. The obvious progress this week was getting the marble counters & faucet installed. It's so beautiful my hubby was just standing in front of the counter admiring it last night. ;-) We've had a lot of years with "perfectly good Formica" and the idea of cleaning an undermount sink? Pinch me. Yes, I know marble can stain but this bathroom will be mainly used by my two boys and guests, so I'm not too worried about wine stains or makeup. Extra bonus is the company sealed it with a product that claims it's good for ten years. 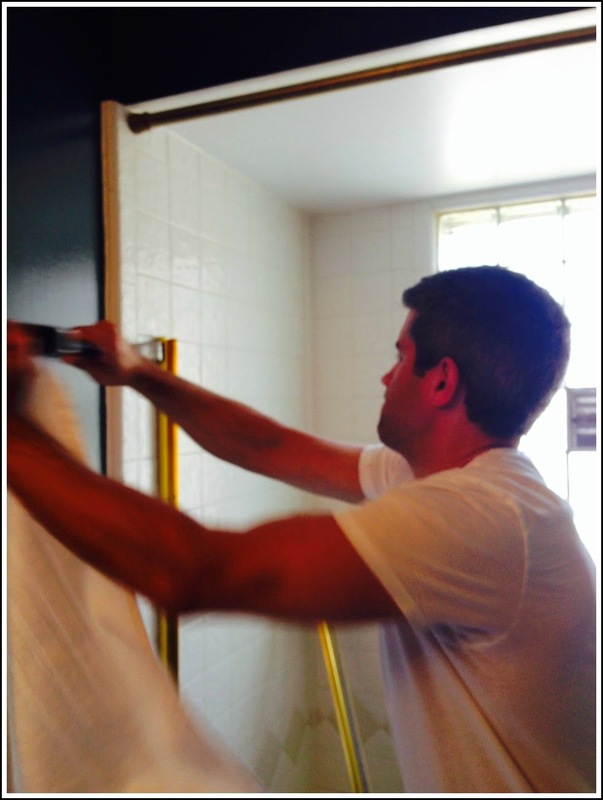 Other progress...Towel hooks are up. Here's a small preview. "J" for one of my boys and "G" for guest. I have four of these hooks total. Love them. Boys love them. The problem of the perpetual towels on the floor has been solved. 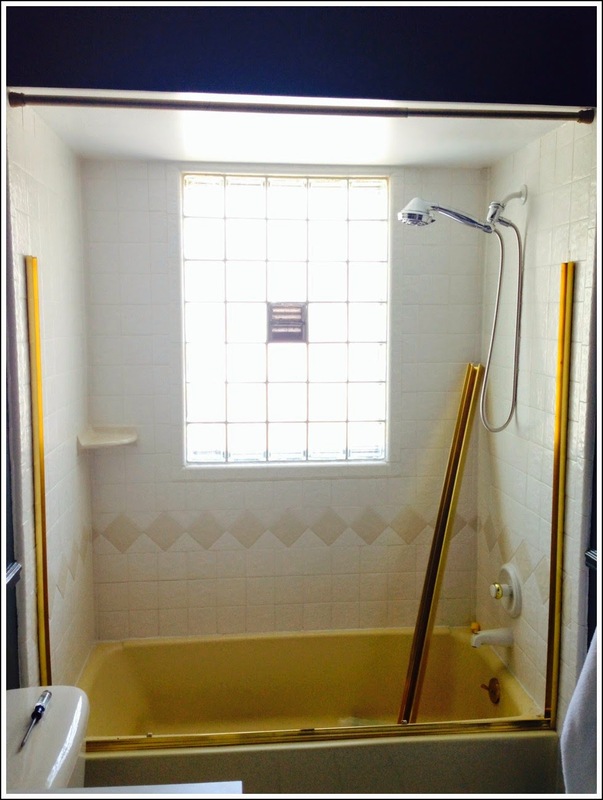 The goal for this week was to remove the shower doors and paint the tub and tile. See? This was living under the rails. I've been working with caulk softener and a razor blade (cut myself twice so far) but this silicone is a b**%#. I think because the wall tile is textured, it's making it extra difficult to scrape off the caulk. I have the big chunks removed, but there's still a film left over, and I know my paint won't stick until the tiles are completely clean. Tips welcome. After using the crowbar, we had a couple casualties in the shower area, but thankfully there was a big ole box of these tiles in our basement and my resourceful husband just replaced them. No worries. Ta Da! No more shower doors. The room feels much brighter and larger. I love it. Obviously I haven't painted the tub and tile yet, because I'm still working on the ridiculous caulk. But it has to get done, so if you need me anytime in the next week I'll be in the bathroom. If you've been following on Instagram for sneak peeks of the #oneroomchallenge, then you know that I've partnered with Tonic Living to put this masculine bathroom over the top. 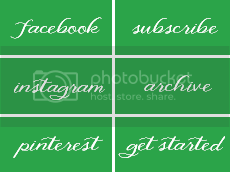 That's all I'm willing to say for now, but I leave you with this image from Tonic Living's Website as a teaser for next week's post. I spy some pretty marble! Your faucet looks FABULOUS!! The counter and faucet are gorgeous!! Love those hooks too. Oh dear lord we are married to the same man ("perfectly good".) LOL!!!! they even look alike. I am blown away by the gorgeous faucet and the marble! A.Maz.Ing! 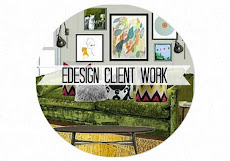 Seriously, I'm loving this project, and dying to see that fabric in the room. Just killer, Abby!! I am obsessed with your faucet. Don't be surprised if you see it pop up in my powder room soon! Love that fabric too! Haha...I would have originally had the exact same comment from hubster;) The marble is fabulous and with that stunning faucet, so so good. And I can't believe how much brighter the room looks with the glass gone! I can't wait to see it all painted with that gorgeous TL fabric! Sounds like something my husband would say. They're all the same, I swear! Marble makes everything better doesn't it? And I love your fabric choice. 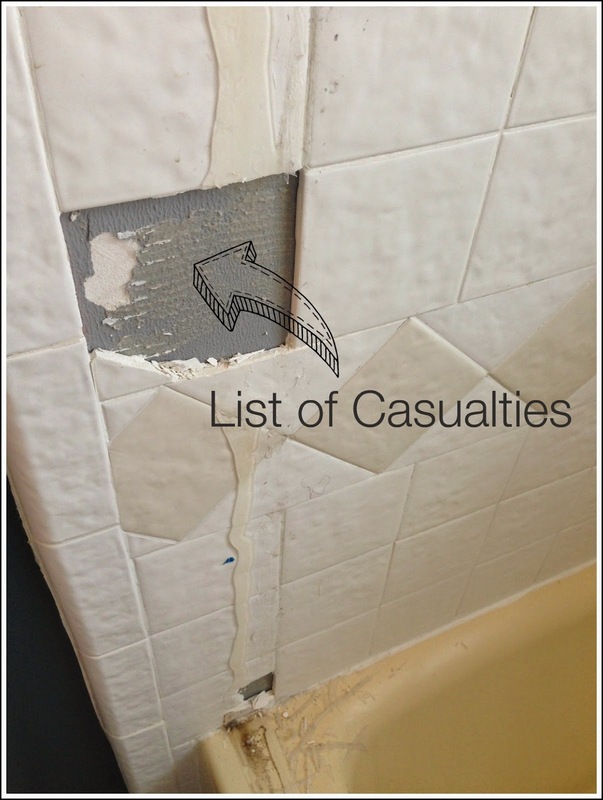 Regarding the caulk on the tiles...since you have box of replacements, can you just pull out the affected ones? I think it would be easier than slicing up your hand. Oh girl, I wish I could wave my magic wand and make that caulk disappear for you. Everything's looking great! That countertop is fantastic and paired with that faucet? Wowza! It looks fabulous, Abby! Great score with the countertop and I loveeee that fabric. It's going to be a great makeover!! Be gone shower doors! What a difference!! And the marble and new faucet are simply perfection my friend. Can't wait to hear about the fabric next week! How the hell are you going to remove that vent? I can't even imagine.....But back to the countertops.....yes....they are fabulous! Are you painting the bathtub and tile????? It is crazy what lives under the caulk. Good on ya for all that hard work. The faucet and marble look awesome. Good luck this next week! More coffee is right! That marble is GORGEOUS, and I'm still dying over the brass faucet... LOVE!!! I cannot wait to see more of that fabric. This bathroom is going to look AMAZING!!! That marble though!?! Need it! Goo Gone makes an extra/industrial strength formula that might work on the silicone haze. We used it last year when we got adhesive on our exterior siding. The adhesive wasn't silicone, but you might try that! We found it at Lowe's. Thanks Abby! I will try that! The marble and brass faucet were a brilliant choice for your room. I wish I had some tips on that silicone for you. You almost made me spit my coffee out with that comment from your hub! I can only imagine the eye roll mine would've gotten from me had he said those words, hahaha! But that marble and faucet are incredible! Ok your list is making me feel a little better about my own insane to-do list!! EEK! That faucet and paint color are a match made in heaven! That fabric and faucet are phenomenal!! 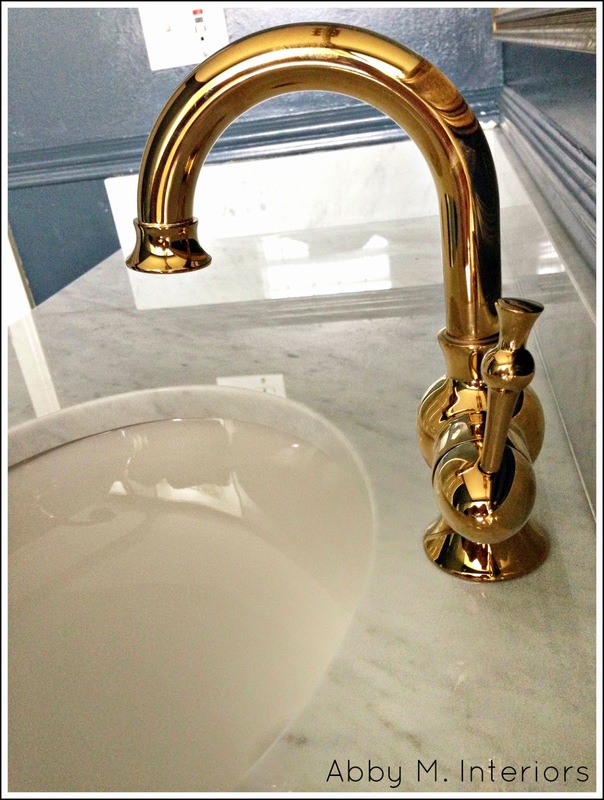 The gold faucet and marble combo are gorgeous, absolutely love it! I hope you can find a good way to remove those stubborn silicone. P/S: I am hosting a giveaway on my blog, by the way. So, come by and enter for a chance to win a fab handheld vac from Black+Decker! 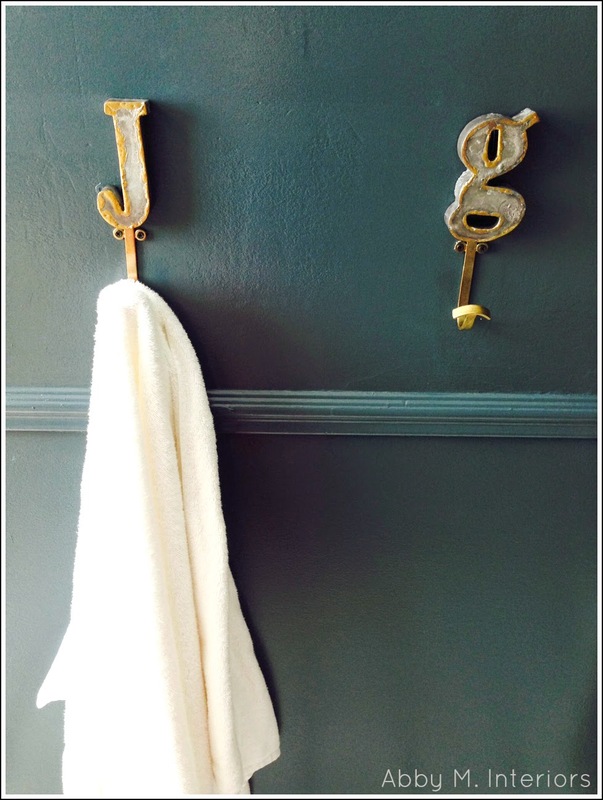 LOVE the towel hooks! So stinking cute! Can't wait to see how it all comes out. love the brass fixture and that fabric is just fabulous!!! it is looking so good!! That was hard work you did in that bathroom. The towel hooks are so fun. Love them. And I'm really loving that fabric. Stunning!!! 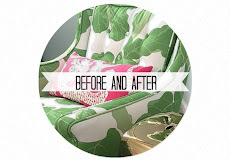 I have a lot of "perfectly good formica", too, so great tips on how to fix that! :) Where did you find your remnant? 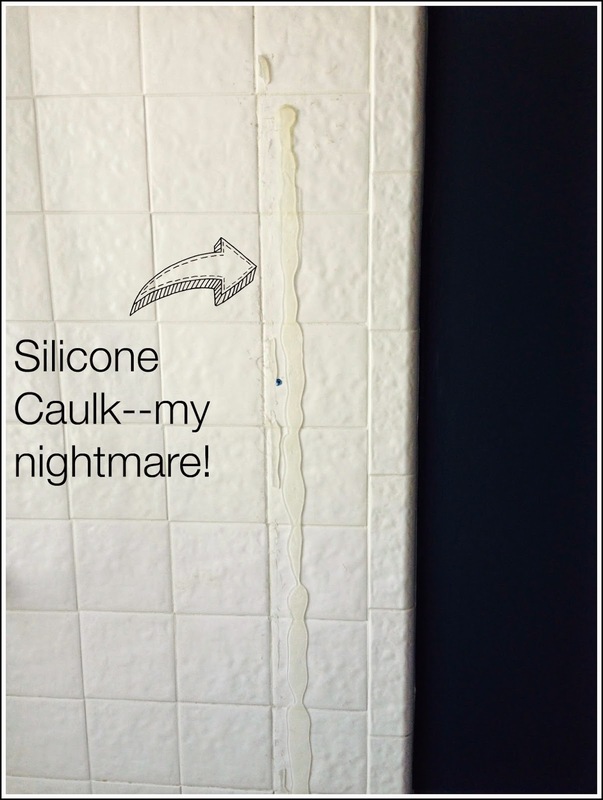 Good luck with your caulk! oh HELLO pretty fabric. Looking forward to seeing that! Faucet and countertop are quite handsome. Glad you won that battle. Marble and brass is so luxe! 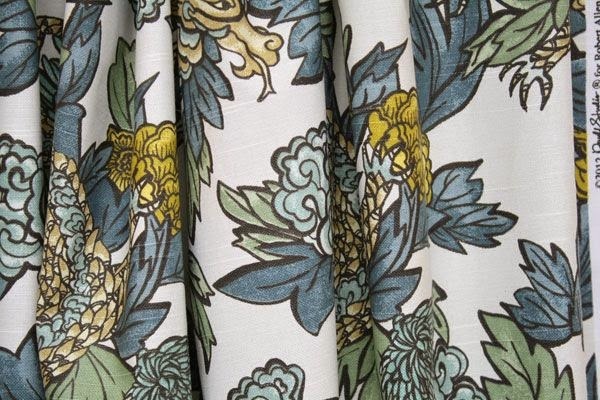 Loving the fabric choice too - I've seen it locally and its stunning!! Yay!!! I got a new marble counter too (forgot to post it this week, DOH) and it made everything so much nicer. Can't wait to see what you do with that yellow tub. Wow, Abby, the countertop looks amazing. I love it and the pretty faucet, too. 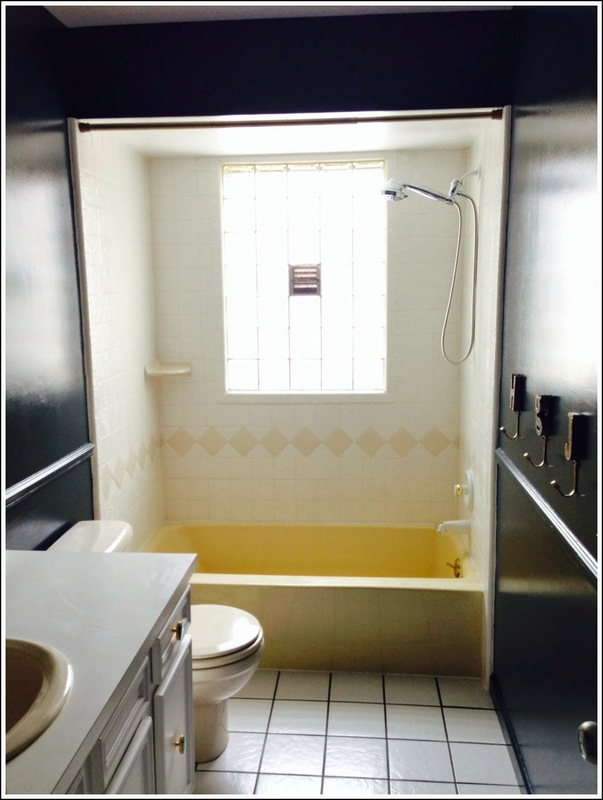 I feel your paint with those doors, and I also have no idea how you are going to paint the tub and tile. Can't wait to see how that goes. Good luck, it looks great. Abby I am absolutley loving the direction your bathroom is going. I have marble counters in my guest bath that is the main bath in our house. In fact it is vintage marble and I LOVE it. Yes it etches, but who cares it is gorgeous! So happy for you that you chose marble. YOU are going to love it. Ugh, what a caulk nightmare. But in other news, your new marble counter is simply gorgeous. Can't wait to see the Tonic Living fabric in action! Your counter is gorgeous and I love the dark paint (again)!! I'll be watching closely on the tub painting, I have a client that would love to do it! Good luck this week, Abby! That marble counter is killer, especially with the faucet! I love the deep, moody feel this room has. Can't wait to see more! great tip on the marble! will have to keep that in mind for future bathroom renos. it's all looking fabulous, lady! get to work on that caulk. 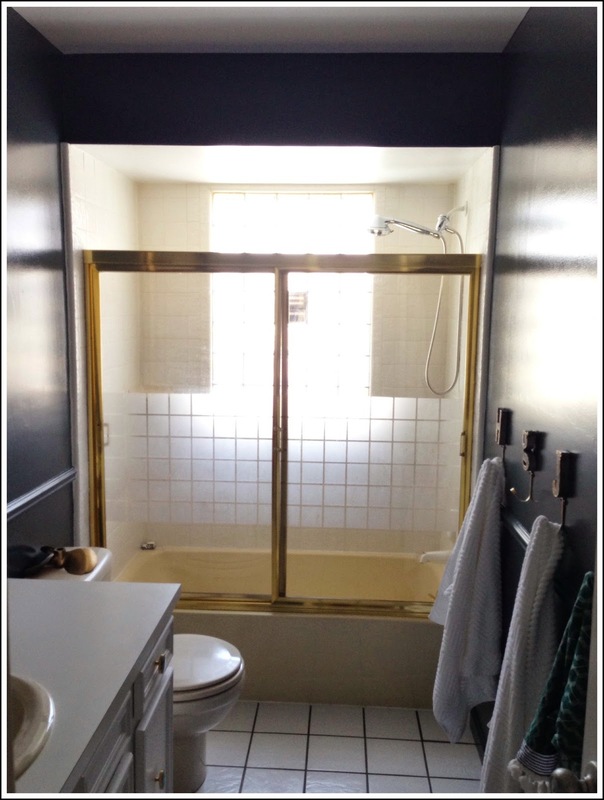 i can't wait to see that tub transform! Your counter and faucet are LOVELY!! Good luck with the silicone. I can't wait to see this completed. That fabric is gorgeous! lovely! 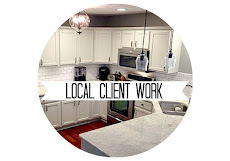 the faucet and countertops look amazing and you fooled me if you are not typically a DIY gal! I am eagerly awaiting the painting of the tile … very inspiring!! Countertops perfect!! You will LOVE the marble! Put on the gloves for protection. With a knife or razor blade, cut away at any of the frayed silicone caulking. Splashing water on the caulking will moisten and loosen it, making it easier to cut away [source: Carter]. Make a mixture of flour and water, after removing as much of the caulking as you can. 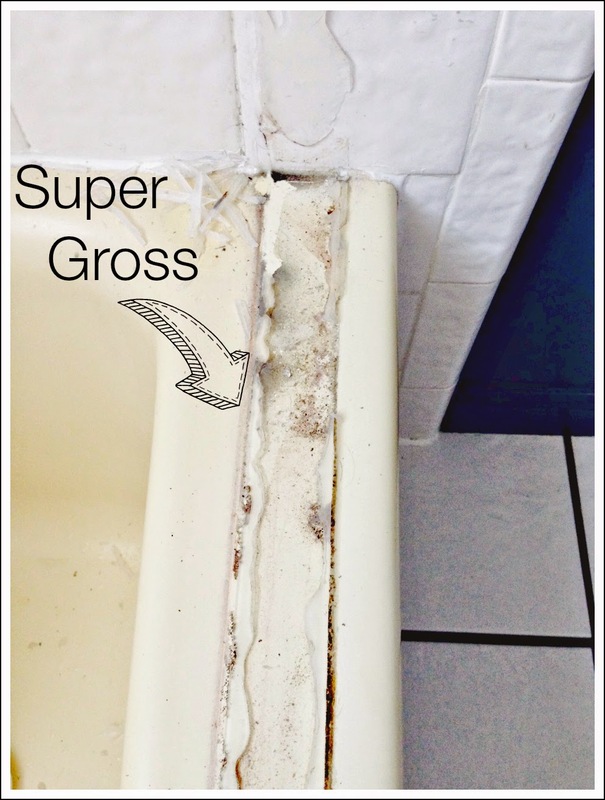 The amounts you use will depend on how much caulking you're removing. Start with a cup of flour and several tablespoons of water. Mix the two ingredients, adding more water or flour, until you get a thick paste. Remember to use white flour -- not whole wheat flour. You want a thick, binding paste and whole wheat flour won't give you as thick a consistency [source: Eakes]. Spread the thick paste over the remaining silicone caulking with your finger. Wait for the mixture to dry and adhere to the caulking. Wash the paste away with water. The caulking has also been washed away, leaving a clean surface for you to apply fresh caulking [source: Eakes]. I was going to suggest Goof Off, but if the flour doesn't work, Goo Gone (recommended above) sounds good, too! Swooning over the countertop and faucet...and that fabric from Tonic!! Hooray for fabulous marble and under-mounted sinks!! I never want to clean another surface-mount as long as I live! 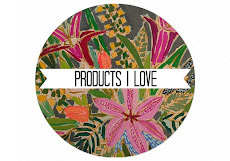 I can't wait to see what you have in store for the floors...I think I remember seeing something fab on instagram. I am LOVING this progress!!! Have to check out Tonic Living next. Have a wonderful weekend...can't wait to see more. Great looking counters and faucet for sure! And I love that fabric! Shower curtain? Death to the perfectly good formica! Soooooooo glad you won that battle. The faucet and that countertop stole my heart. A vent in the middle of glass block tiles? WTH? dying to see how you solve that crisis. Anywho, great job so far and can't wait for the reveal.